Jacquard polyester outer. Mesh lined. 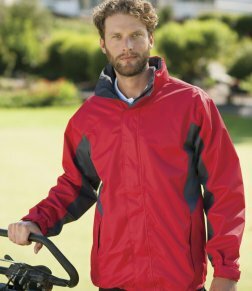 Waterproof, windproof and breathable Isotex® 5000 fabric. Taped seams. Concealed hood. Full length zip with tear release storm flap. Part elasticated, adjustable cuffs. Two front zip pockets and one inside pocket. Adjustable drawcord at hem.